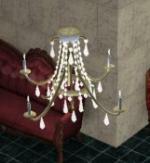 Crystal chandelier (hanging lamp). Original MESH and two recolors. Four coordinating columns; Two, 2 story columns and one single story are offset to sit at the edge of the square to create balconies and fancy fronts. 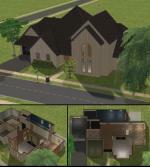 I included a centered single story for edges and interior rooms. Original MESH and three recolors for each in maroon, blue and solid white/grey. 18,887 Starter with 2 bedrooms and 2 baths, great room, garage and small back patio.